Nodelizer Mobile App for Android & iPhone/iPad gives you advantage of breaking the limitation of monitoring from desktop only. 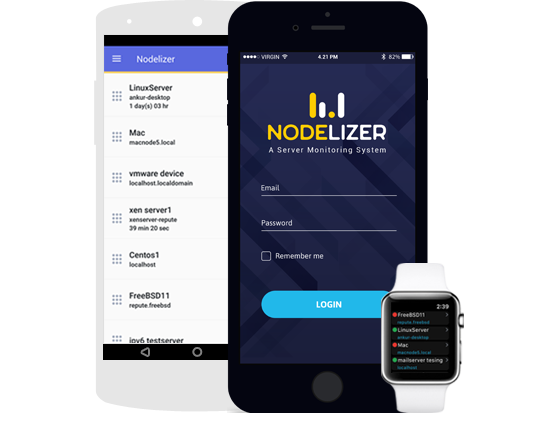 Nodelizer Mobile App for Android & iPhone/iPad gives you advantage of breaking the limitation of monitoring only from your desktop, and allows you to remotely track status, health & availability of your systems, anytime – anywhere. Nodelizer app helps You to view the snapshot and graph of different service from different servers easily. Getting alerted of any Server issues on your Mobile gives you a head start on the problem about what’s being affected and its cause, before you actually get to fix it. You can stay updated whenever your Server device has any Active(Open) Alert Issues. iOS Apple Watch support is also available where you can view your Server-status, Application-status, receive push notifications.